Jokamiehenoikeus. You may not be able to pronounce this Finnish word, but you’ll love its concept. “The freedom to roam” means you can sail or swim, fish or forage, hike or sleep just about anywhere in this Northern European country. Sure, there are a few exceptions. You can’t raid someone’s garden, disturb the nest of a breeding bird, or hunt in a nature reserve. The wilderness belongs to everyone, though. The Nordic countries, the Baltic states, and a handful of other environmentally focused European countries (like Scotland and Switzerland) have all adopted this philosophy. You’re planning on taking advantage of it in Finland. Kvarken is the perfect place to practice jokamiehenoikeus. This is the narrowest part of the Gulf of Bothnia, which separates Finland and Sweden. The Swedish side, called the High Coast, was named a UNESCO World Heritage Site in 2006. 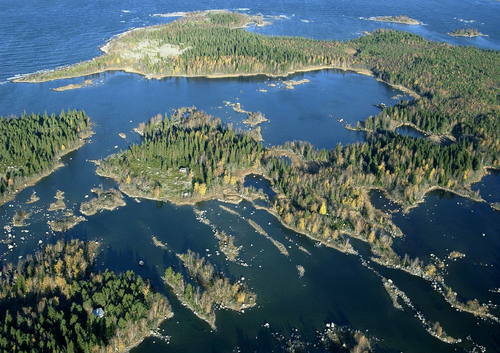 The Kvarken Archipelago—more than 5,000 islands off the Finnish coast—was later added to it. The area is known for its unique landscape. It used to be covered with heavy glaciers, and the gulf—the northern extension of the Baltic Sea—would freeze during the winter. Since the glaciers melted, the land has been rising about one-third of an inch every year. It’s unusual in a world worried about rising sea levels. Besides its rare landscape, the Kvarken Archipelago is also beautiful and peaceful. Bridges now connect the main islands, including Replot and Björkö, to the mainland. You’ll hear both Finnish and Swedish spoken in the historic city of Vaasa, since it was long ruled by Sweden. Across the bridges, you’ll find pristine islands and washboard moraines (ridges formed by the glaciers). Birch, pine, and spruce trees cover the islands. Lemmings, lynxes, and raccoons live among them. White-tailed eagles and velvet scoters do, too. Pastures are home to hearty cattle and sheep. Wild berries, including tart cloudberries and lingonberries, grow in random spots. Colonies of Baltic ringed seals claim the outer islands. Wooden jetties provide access for those arriving by water. While nature stations offer basic accommodations and kayak rentals. You’re starting on Björkö. The 27-square-mile island used to be a mail station during Swedish reign. It wasn’t connected to the mainland until the Replot bridge (the longest bridge in Finland) was built in 1997. Björköby, near the center of the island, is its main settlement. Svedjehamn (the harbor) and the Saltkaret Observation Tower lie due north. From the all-black Saltkaret, there’s a breathtaking view of the harbor, the island, and much of the archipelago. It’s also near the trailhead of the Björkö-Panike Nature Trail, a 7.5-mile trail that passes the rising shoreline, perfect bays, and a dense birch forest. It’s the ideal introduction to the islands. Now go roam.